The WWE’s 2019 Royal Rumble took place on Sunday, January 27th. 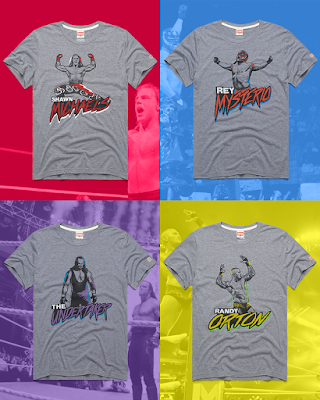 To celebrate this iconic event’s 32nd anniversary, HOMAGE released a new WWE t-shirt every Thursday of January. But some weeks just one shirt isn’t wasn’t enough. Check out HOMAGE’s WWE Royal Rumble Winners T-Shirt Collection featuring The Undertaker, Randy Orton, Rey Mysterio and Shawn Michaels. It’s not easy winning the Royal Rumble. There’s 29 other competitors hell-bent on being the last one standing, and as you know, it’s every man for himself. But these superstars defeated the odds, reigned supreme and prepared for Wrestlemania. These WWE Royal Rumble Champion T-Shirts are currently available at the HOMAGE online store in grey, sizes XS-3XL, for $32.